St. Mary’s is located in Tuxedo, NY, a town with a population of approximately 3,600, about 40 miles northwest of New York City. 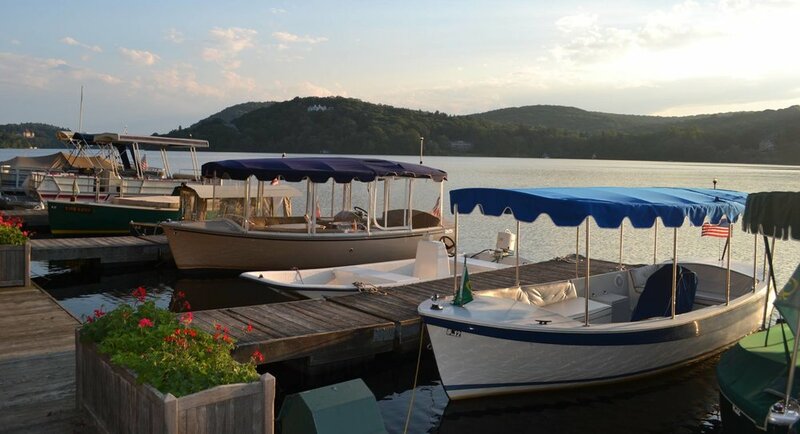 Tuxedo is nestled in a narrow valley between two state parks, Harriman and Sterling Forest, along the Ramapo River in southern Orange County. It is a place of great natural beauty. It is remote enough to give it the feel of a small town, but close enough to afford residents access to all that New York City has to offer. The town was incorporated in 1890 and currently encompasses more than 31,600 acres, over 70% of which has been designated permanent open space. In the downtown area, known as the Hamlet, there is a train station, post office, library, volunteer fire department, volunteer ambulance corps, Our Lady of Mt. Carmel Roman Catholic Church, the Tuxedo Historical Society and a public school consisting of the George Grant Mason Elementary School and the George F. Baker High School. There is a weekly Farmers’ Market at the train station in the summer and fall. While there is not much commercial activity in Tuxedo, there are several major shopping centers in neighboring towns. Nearby recreation facilities include: public golf courses, Mt. Peter ski area, a network of hiking trails (including a portion of the Appalachian Trail), Storm King Art Center and, seasonally, the New York Renaissance Faire. Located at the edge of the New York Metropolitan area, Tuxedo has convenient modes of transportation to both New York City and Bergen County, NJ. The New York State Thruway and NY/NJ Route 17 run through the town. In addition, we have daily train and bus service into Penn Station and the Port Authority, respectively. While St. Mary’s is technically sited in the Town of Tuxedo, access to the church and rectory is through the gates of the Village of Tuxedo Park. Tuxedo Park, commonly referred to as the Park or the Village, was founded in 1886 as a private shooting and fishing preserve with easy access to New York City. The Park’s history has been well documented: virgin woodlands surrounding Tuxedo Lake were transformed in just a few short months into an exclusive retreat for wealthy New Yorkers through the vision, energy and financial resources of Pierre Lorillard IV. It was among the first planned communities in the United States and quickly took its place on New Yorkers’ social calendars, becoming a year-round residential community soon after. Principally due to the magnificent late 19th and early 20th century architecture by such renowned architects as Bruce Price, Carrère & Hastings, James Brown Lord, McKim Mead & White, John Russell Pope and Warren & Wetmore, the entire Village was listed on the National Register of Historic Places in 1980. Today, Tuxedo Park is an incorporated, self-governing village within the Town of Tuxedo, encompassing more than 2,000 acres of mostly forested land with three lakes and approximately 320 homes. About 51% of the approximately 625 residents live in the Park full time, resulting in a sizeable weekend and seasonal population. It has its own municipal government, police department and public works department. The Village is also home to the Tuxedo Club (a private country club), the Tuxedo Park School (an independent day school for Pre-K through 9th grade) and the Wee Wah Beach Club. The breathtaking and quiet environs, storied history and a love of architecture attract residents to the Park. Attempts to revitalize of the Tuxedo/Sloatsburg commercial district are in the initial stages. Envisioned as the “Gateway to the Hudson Valley,” businesses with an eye to locally sourced food and antiques are being targeted for potential development. In addition, there is long proposed planned community in the southern part of the Town.